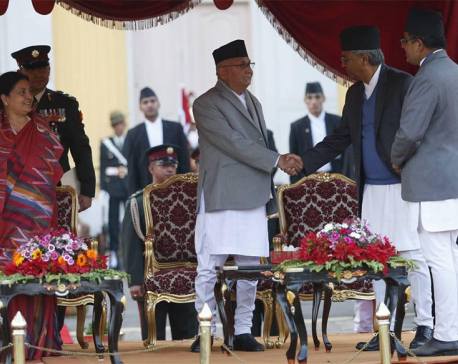 KATHMANDU, Nov 21: The Comprehensive Peace Accord (CPA) inked exactly a decade ago had considered transitional justice a major part of the accord, but this crucial component in the process of establishing sustainable peace has remained unfulfilled to date. In the CPA, the government and the then rebel CPN (Maoist) agreed to make public the real names and addresses of people disappeared by them and of those killed during the conflict, and provide information thereof to the respective families within 60 days after the signing of the CPA. Likewise, both parties to the CPA had agreed to constitute, through mutual understanding, a high-level truth and reconciliation commission for establishing the truth about those who committed gross violations of human rights and were involved in crimes against humanity in the course of the armed conflict. Following the signing of the CPA, the Interim Constitution mentioned the task of forming a high-level truth and reconciliation commission as one of the obligations of the state. However, it took more than eight years to form the Truth and Reconciliation Commission (TRC) and the Commission of Investigation on Enforced Disappeared Persons (CIEDP). Both the commissions were formed only on February 10, 2015. Though the CIEDP and TRC Act was endorsed by Parliament in 2014, the commissions have had to wait for another year to get the necessary regulations. Meanwhile, the Supreme Court in February, 2015 annulled some controversial provisions of the act, stating that these provide unwarranted discretionary powers to the transitional justice mechanisms to grant amnesty and to the Ministry of Peace and Reconstruction to prosecute human rights violations or not do so. Likewise, the UN bodies have been demanding that the act should be amended to match up to international standards of transitional justice. The two commissions themselves are also demanding amendment to the existing act to incorporate the apex court's verdicts in various transitional justice cases. The commissions have two-year terms with the possibility of a one-year extension. While the TRC has received 57,753 complaints so far, the CIEDP has received 2941. However, the commissions are still not able to conduct substantive investigations into the complaints due to the delay in amending the crucial act. "There is a suspicion within the commission that a ploy has been hatched from all corners to render the existing commission a failure," said Shrikrishna Subedi, a commissioner at the TRC. Coordinator of the Conflict Victims Common Platform, Suman Adhikari, whose father was killed by the Maoists, said that flaws in understanding the concept of transitional justice have delayed the entire process. "From the very beginning transitional justice was understood either as a process of amnesty or as a process of prosecution only. This ultimately harmed the process of establishing truth, securing justice and establishing sustainable peace," said Adhikari. "Meanwhile, the political parties have not taken the transitional justice process seriously. They tried to complete it just as a ritual. They were not serious while drafting the act and also while forming the commissions," he added. On the other hand, Attorney General Raman Shrestha has opined that changes in the power equation in the first and second Constituent Assemblies have delayed the completion of transitional justice. "The political leadership tried to use the transitional justice process as a tool to negate each other despite knowing that the peace process would not be complete without completing the transitional justice process and the country would not move towards peace and prosperity without completing the peace process," said Shrestha.